[Well, I've never tried to blog from my phone... In a dark, powerless house... But I don't have a whole lot else to do besides sleep so here goes nothing.] Yesterday, I made a 45 minute detour to try the latest Baskin Robbins flavor of the month. Now I made a promise on the nosh show episode 20 that I would try this one and figure out what was the deal with these intriguing popcorn bits. Long story short, I was a bit let down on the first bite, but, at the same time, it avoided the mistakes of popcorn flavors past. 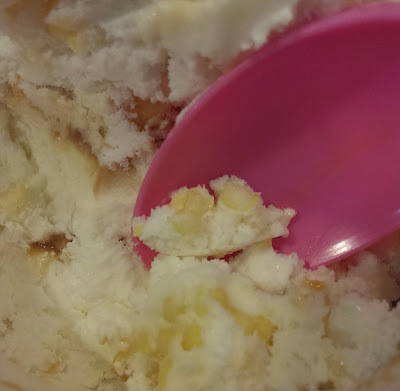 It could have been overly salty or fake buttery, but instead showed the quality of other baskin robbins flavors... And that's why it grew on me despite some misgivings. I may have gotten a few decent sized clusters, but nothing like what Adam from TIB saw. Often my bits were broken like you see in this picture. Overall they were somewhat crunchy, and kind of fun, but not mind blowing, and no big flavor punches here. We still have premium ice cream, and the swirl is well done, but the overall flavor is more flat popcorn than fresh popcorn. I mean it's uncanny how it tastes like real popcorn, it really is undeniable, but it's not the popcorn I desired (don't get me started on how few theaters still pop fresh popcorn). 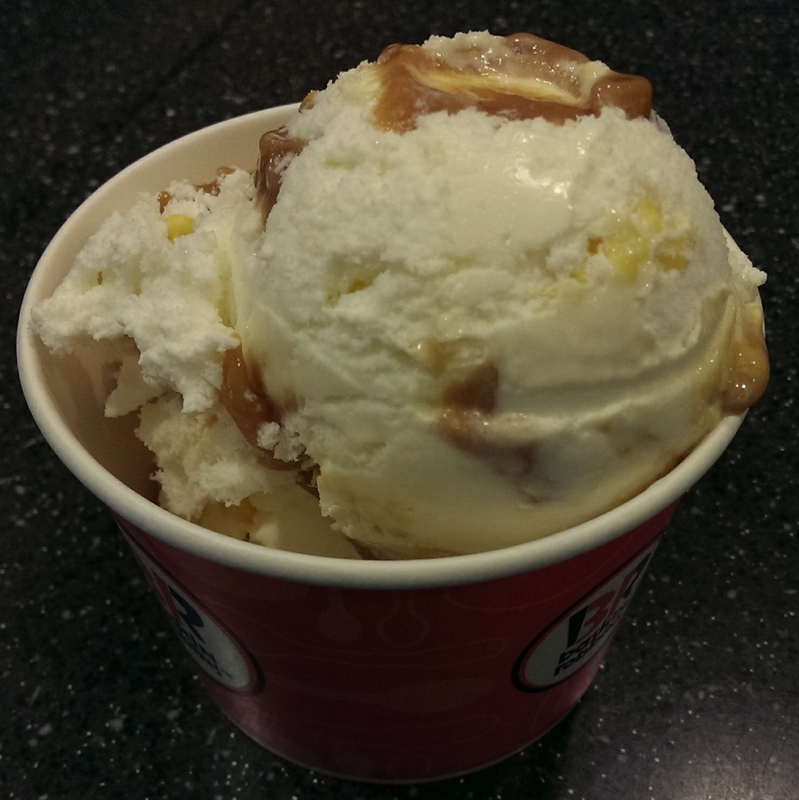 I did still enjoy it to some degree, but expectations were way too high for this first scooping. It's different, it's novel, and I still liked it more or less, but be warned that results may vary. P.S.S. Seven hours later and the power finally turned back on... time to empty the fridge! But fresh popcorn would get soggy! Gotta say I really loved this one, but you already knew that. To some degree, I think a lot depends on the luck of the scoop and the skill of the scooper. Sorry if you wasted the gas because of me! no worries! the potential payout was too good to risk missing. I still liked it, I just didnt love it. I hope your ice cream stash didn't have to be sacrificed to the power outage! the new groceries in the fridge were a loss, but the ice cream was safe in the basement freezer, thanks for asking!